Excel 5-speed, detachable blade clipper includes: A powerful rotary motor clipper for complete animal grooming. 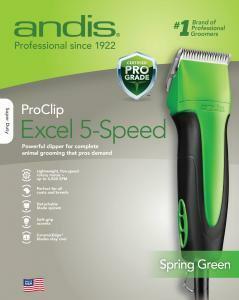 With five adjustable speeds, the Andis® Excel 5-Speed Clipper is a great choice for all your grooming needs. Designed for powerful, precision trimming, the lower speeds are ideal for clipping around sensitive areas while the higher speeds give a nicer coat finish.